Every year the Africa Mercy receives vital upgrades and repairs to continue serving the forgotten poor. I documented the process from beginning to end, gaining even more respect for the engineers, welders, electrictians and countless other workers who keep the operations going. This short video is an impression of that very important time in this non-profit's efforts. I came across a lot of babies and young children on the dock by outpatients and admissions. Some were patients others children of patients. 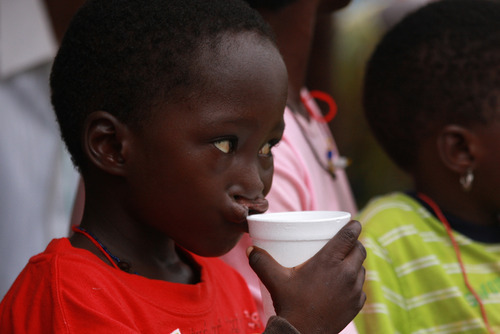 A cleft lip patient takes a sip of some cool water. Despite the heat and humidity high, everyone including the children waited so patiently. It was a humbling sight. Every face had a story to tell. I wished I could have heard them all, there simply weren't enough hours in the day. Their quiet resolve gave me more than I could ever give them. Please see the Celebration of Sight entry for a more detailed write up about the eye program and event. Watching surgeons operate is one of the most amazing experiences. I thought documenting the OR would make me ill. It fascinated me endlessly. Dr. Andrew Kirkpatrick (Canada), General Surgeon, operating on a hernia patient. Zhalmaine Tuya (New Zealand), OR Nurse, assisting during a maxillofacial surgery. I watched Dr. Gary Parker (U.S.), Chief Medical Officer, and Togolaise surgeons perform an operation to remove two large facial tumors from a sixteen year old Nigerian girl. One of the tumors weighed eight pounds. The entire procedure took a little over 12 hours. Without this surgery, the growth of the tumors would have slowly suffocated the patient to death. Both short and long term volunteer doctors performed life saving operations every day. The human body is a wonderfully intricate design of both form and function. To think that life was a biological accident that happened by chance is far too simple an explanation for man's existence. Looking upwards, I cannot deny the miraculous beauty of human life. Ophthalmic Surgeries: 725 Cataract Surgeries, 103 pterygium surgeries, 3099 eye evaluations and trained 3 Togolese eye surgeons. Maxillofacial Surgeries: 26 cleft lip and palate surgeries 255 maxillofacial (tumors) head and neck surgeries, and the training of 3 Togolese surgeons. Plastic Reconstructive Surgery: 72 released burn contractures, combined fingers and other procedures, 889 physical and occupational therapy services. I don't think I'll ever forget Komla. At times he was super sweet and other times a complete pistol. I think everyone who met him had a fun moment with the kid. I was in D-Ward taking some post-op photos of a cleft lip patient when he came in and dragged me out into the hallway. He managed to get a giant yellow balloon stuck behind a gate where the trash bins were and needed help getting it out. We ended up smacking the balloon around and causing a ruckus in the hallway for a while. Komla yelled and laughed as we chased the bobbing balloon around. But he wasn't always so joyful. Komla rides a big wheel with Ho Jin Na, Ward Nurse. Komla began a painful journey with a leg contraction when he was only two years old. While visiting his grandfather's farm, he got a cut on the back of his leg and the wound became extremely infected. Simple treatments with peroxide or iodine could have prevented this. But because there are no disinfectants readily available, the infection got completely out of control. 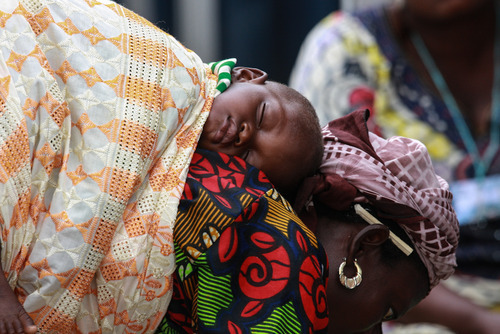 This is the sad reality of the lack of medical care in West Africa. Eventually all of the skin on the back of the leg rotted away until the bone was exposed. The body desperately tried to heal itself and cover the exposed area. Its only recourse was for the lower leg to contract upwards, fusing the calve with the hamstring area. His leg that had once been straight reformed itself into the shape of "V", losing all mobility. For six years he has been unable to use his leg. 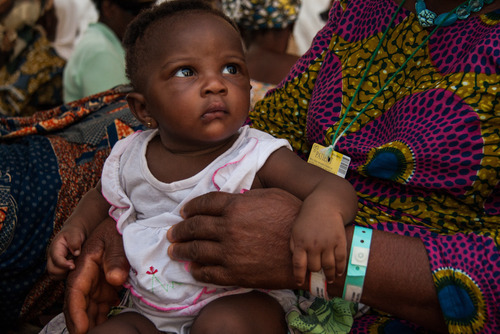 After going through screening, Komla was admitted for surgery on Mercy Ships. Surgeons cut the skin separating the calve and thigh. They then applied a skin graft to the wound areas. And so began a long recovery and series of trials for he and his family. Initially his mother was the caregiver who stayed with him on board. Marine regulations prevent pregnant women from being on ships and because she was due in only a few months she had to return home. There was no exempting them even though the ship was not sailing. This wasn't such a huge problem seeing as they had four other children to take care of back home. So Komla's father had to take a leave of absence from his teaching position at a school. Initially it was thought that the whole recovery process would take four to six weeks. Unfortunately this was not the case. Komla and his dad at the H.O.P.E. Center. Like most little boys, Komla is active and can't sit still. He got himself into mishaps that would prolong his recovery for months. He would wake up in the middle of the night while everyone else was asleep and hop around without his splint and the ankle became swollen. The inflammation finally subsided and he didn't need to be in the hospital for dressing changes. He and his father then went to the H.O.P.E. Center (see previous story for explanation of this out-patient facility) as he recovered. Within three days, he was outside running and jumping in the dirt outside the center. His dressing got so loaded up with sand and he constantly scratched the wound area further agitating it. So back to the hospital he went for more treatments. One step forward two steps back. Over the coming months, Komla slowly began to heal. Since he had to use a crutch for most of his life, Mercy Ships physiotherapists worked with him to relearn how to walk. Fran Van der Westhuizen, Physical Therapist walks with Komla up the gangway. His father is amazingly patient and had lived in the hospital as his son recovered. Finally after four long months, Komla and his father were able to return to their village. His mother had just given birth to their fifth child and Komla would meet his baby sister for the first time. Seeing him leave was bitter sweet. Though looking forward to going home, Komla became attached to everyone who worked with him. Jen Petershmidt, OR Nurse and Laura Coles, Ward Nurse. Tears were shed from both he and the medical staff as everyone gathered to send him off. Some nurses and a physiotherapist went with him and his father to bring them home. Jen Peterschmidt and Michelle Vujicic, Ward Nurse walking Komla down the gangway for his final departure. Medical staff demonstrated ultimate compassion, walking side by side through all his trials. Though Mercy Ships has now departed from Togo, Komla continues his journey stronger (and probably more mischievious) than ever. There are many factors that contribute to a patient's well being. If someone receives care onboard the Africa Mercy, they still may end up receiving an infection or worse, dying from other preventable causes if not taught healthy habits. Education, in addition to surgery is critical for long term well being. Medical crew member Becca Taylor heads up the patient education program. She has developed a curriculum to train the day workers on how to teach the materials. Day workers (pictured in green scrubs) are locals who are paid to help support the full time crew of the Africa Mercy. They work in every department and help make all operations possible. Knowing the local culture and dialect, Day Workers have an immense advantage in making teaching more relevant to patients. Its also empowering to let the nation take care of itself rather than having outsiders impose their own ideas and expectations. Every country is different so teaching materials and methods have to be adapted. 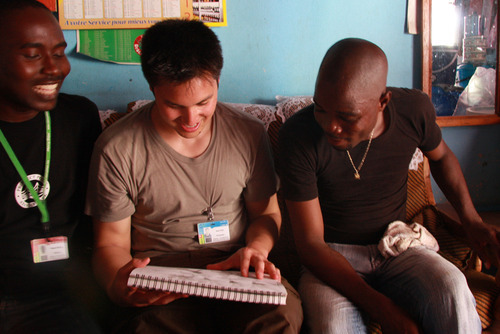 What Becca had learned previously in the Sierra Leone field service had been reworked for Togo. A day worker uses visual aids to teach patients about healthy living habits. 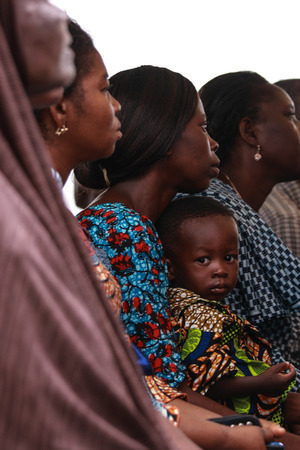 Various topics that are covered in health education involve hand sanitation, nutrition, nutritional deficiencies, immunizations, childbirth planning, dehydration, diarrhea prevention, stress management, malaria prevention and general healthy habits. The dental and eye teams came also to teach about teeth and eye care. While some patients receive these lessons in the wards on the ship, many are taught at the HOPE (Hospital Out-Patient Extension) Center. This is an off-ship facility and that can house 40 patients and their caregivers at a time. When coming from far away, patients cannot afford to travel back and forth during treatments so they stay at the center. This frees up bed space in the wards aboard the Africa Mercy so that patients with more serious cases can be tended to. Land Rover shuttles provide transportation to and back from the ship for post operative check ups. Patients receive teaching at the HOPE Center. 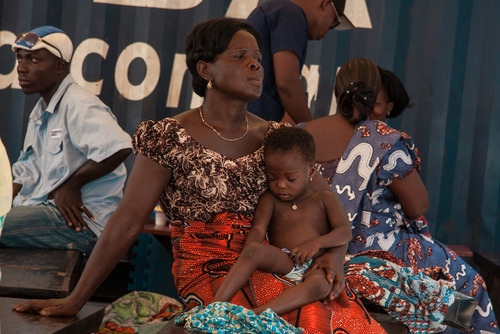 When Mercy Ships first served in Togo in 2010, it was given space for the HOPE Center by the Togolese Government. In return Mercy Ships renovated a wing of that facility with donated funds. Upon leaving the country, Mercy Ships returned the facility back to the Togolese Government to establish the Maternal Health Centre. Small remedies can make a big difference in long term sustainability. In the end, its up to the patient to follow through and put the teaching into practice. Sometimes the best help you can provide is to plant the seeds of knowledge and hope. I was able to document a beautiful ceremony called the Celebration of Sight. 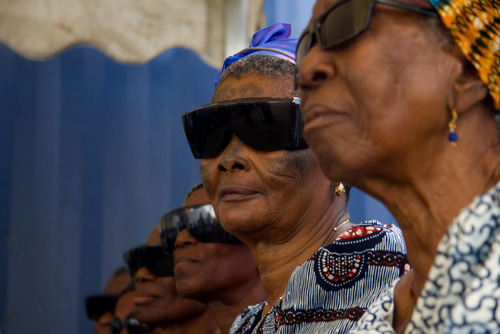 Eye patients who had received cataract treatments come together with medical staff to celebrate the restoration of their vision. I sat down with Keli Price, a ward nurse who helped the eye team with screening to ask her about her experiences in the clinic during the Togo field service. It was a humbling experience to hear of the patients backgrounds and all the hard work that the eye team had performed over the past five months. Patients receive post op eye cleaning after bandages are removed. Patients wear protective glasses as their eyes heal. The eye clinic had two goals in mind while admitting the right type of cataract cases: to restore sight and to train one of the very few local eye surgeons, Dr. Wodome. The ophthalmologists needed to find text book cases that would provide the least amount of complications during surgery and post operation. Dr. Wodome would then teach other eye doctors how to perform the surgery. Day Workers also receive experience operating eye equipment during screening and check ups so they are able to acquire marketable skills. 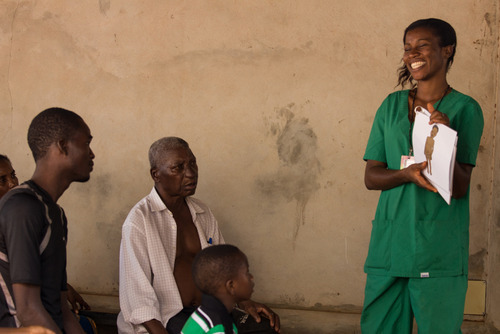 Ultimately Mercy Ships wants to give local medical professional the tools and training they need to be self sustaining. Because their goal was to restore sight to those who had poor or no vision, people with one cataract but one good eye were not admitted. Diabetics were also not admitted due to the fact that low blood supply to the eye prevents proper healing. Patients with Glaucoma would also be turned down due to complications that would arise during surgery. In addition to cataracts staff also looked for patients with pterygiums. This is a condition that occurs when the eye is trying to protect itself from over exposure to sunlight and dust by growing vascular tissue. If this tissue passes the mid point of the pupil, it is too late. Due to the heavy amount of pterygium cases, slots filled up quickly. Though criteria was fairly stringent the staff did their very best to admit as many patients as they could. 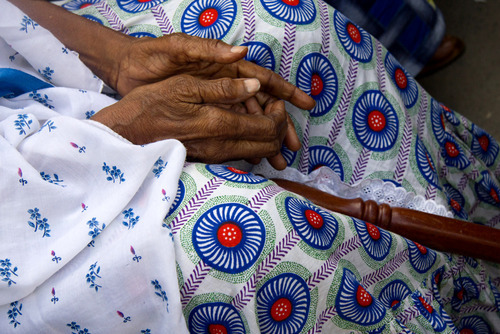 It was emotionally difficult for to turn away potential patients that couldn't be treated. Out of the 3099 people that were screened, 725 were admitted for cataract surgery and 103 received pterygium surgeries. This is still an impressive amount of life changing operations. Most surgeries led to the restoration of sight. In some cases the cataract treament revealed that it was really a preexisting condition such as a damaged retina that had caused the poor vision. In these instances patients surprisingly weren't disappointed but rather thankful that Mercy Ships tried their best. The harsh conditions in West Africa create a culture that seldom complains about life's hardships. The patients' gratitude, despite the final results had been humbling for most of the eye staff who came mostly from Western countries. Keli described an instance in which a patient thought her sight had improved but really hadn't. A local translator (who apparently was a bit overweight) scoffed at the poor woman, asking her why she thought her vision improved. The patient laughed and responded "Because I can see now that you eat too much!" Regardless of the difficult outcome, the culture often encourages thankfulness rather than entitlement. While the series of screenings and post follow ups is a long process, the surgical procedure takes only four minutes. Dr. Wodome cuts through a few layers of cells and inserts a small lens into where the cataract had been. They dilate the pupil and center the lens right on top of that. A patient turned to me and said in broken english, "I can see again. Today is a happy day." Tears rolled down her checks. A patient gives her testimony of receiving sight again. Sight is a gift that we must all be thankful for. © 2012 Mercy Ships-Photos by Ryan Chen. Special thanks to ward nurse Keli Price for her gracious time in supporting the writing of this entry. Everytime I go out on assignment, I'm constantly reminded of the deep needs in West Africa. The streets are filled with stories of the forgotten poor. 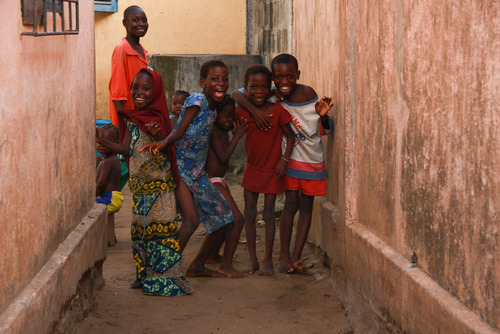 As we walked out of Yawovi's home (see previous story) these curious children followed us down this narrow passagway. As I lifted up my camera to see if it was okay to snap a few shots, they giggled and squealed with delight. I showed them the pictures aftwards on the screen and they cheered, running around. Their beautiful smiles shined through the gritty alleyway. The afternoon light peered through the open doorway, revealing brilliant reds, yellows and blues. Yavovi shared one after another of his colorful poster paintings from his dusty portfolio. His art was like a map of his life. Some images were wild others more subdued. All with a touch of discipline and care that only comes from creating something by hand. I had the privilege of connecting with this very special artist in Lomé, Togo. Yawovi had been a hernia patient on Mercy Ships and we were invited to his home to see how his recovery was coming along. On the ride over I read information on him and realized he too was an artist. We met and after a bit of chit chat I asked about his work. Yawovi pulled out his gouache to show us his art supplies. I exclaimed, "Moi aussi!" (the national language in Togo is French) pulling out my water colors, pencils and sketchbook. Though we had never met, there was a bridge between us. Yawovi had been a teacher by profession. The problem was that he taught in a private school and it would be months before he would receive a paycheck. He and his wife Atikpo Akouvi decided that he should seek out his artistic passions and more steady income. Yawovi landed apprenticeship for two years under a local print maker named Petron Pomnidou. There he would learn skills to become a graphic designer. 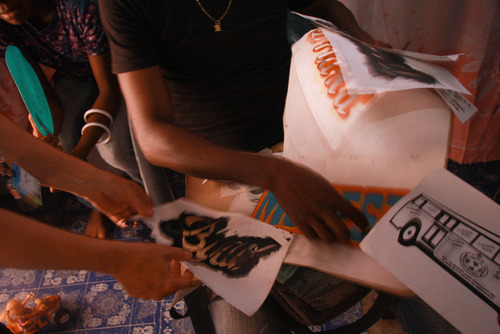 Because there is a lack of machinery to mass produce graphic design in Togo Yawovi learned the art of letter forms and typography to make hand painted signs. The two year program cost 100,000 CFA ($200 US). Atikpo Akouvi's job as a fish monger was not enough to sustain the family. Yawovi drove a zimmi john (motorcycle taxi) and rented out a room in his home to earn income and pay for his training. Disciplined, hard working and passionate, Yawovi quickly gained the respect of his mentor and peers. Unfortunately Yawovi found that the market for graphic designers in Togo just wasn't what he hoped. In addition he developed a painful hernia in 2005 which prevented him from being able to lift and do hard manual labor. He tried various treatments but nothing relieved the constant pain. His situation looked bleak. 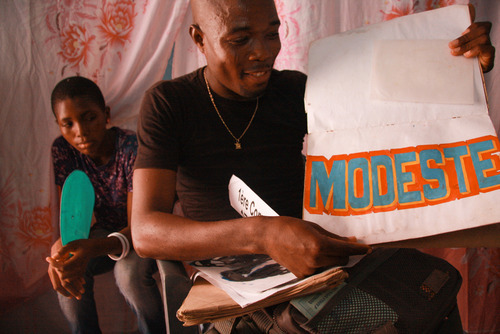 One day his father got wind in the local market that Mercy Ships was on its way to Togo. Excited at the possibility of being healed, Yawovi showed up at 3am on February 1st, screening day. He was one of the first people to line up as well as to receive an appointment card for surgery for March 21st aboard the Africa Mercy. He and his family were thrilled. The surgery went quicker and smoother than he expected. The pain subsided immediately. Yawovi shared with his wife of the great experience he had with the medical crew aboard the Africa Mercy and is so thankful for the operation he received. We all have gifts that we have been given. Free from pain, Yawovi can now use his gifts to create with his hands and provide for his family. Over the next couple days I would meet my peers and get oriented with the ship, its various operations and my responsibilities as a photographer. Our tasks in the media department range from covering patients' stories to shooting before and after portraits (pre and post ops) of those patients for the medical department, to documenting surgeries, ship life, and crew members. The only way that Mercy ships can provide free medical care to the poor is if the crew aboard the ship is entirely volunteer. Everyone from the Captain, doctors to the deck hands are there on volunteer basis. Where does the funding come from? Mercy Ships raises support through corporate and individual donations. The photographers are the eyes of this outreach and give a voice to the work being done. The various procedures that Mercy Ships provides are Maxillofacial (tumor removal and cleft lip/palate), Ophthalmic, General Surgery, Urogynecologic (VVF), Pediatric Orthopaedics, and Plastics. I'm gaining a lot of exposure to the medical field just by being in the wards. 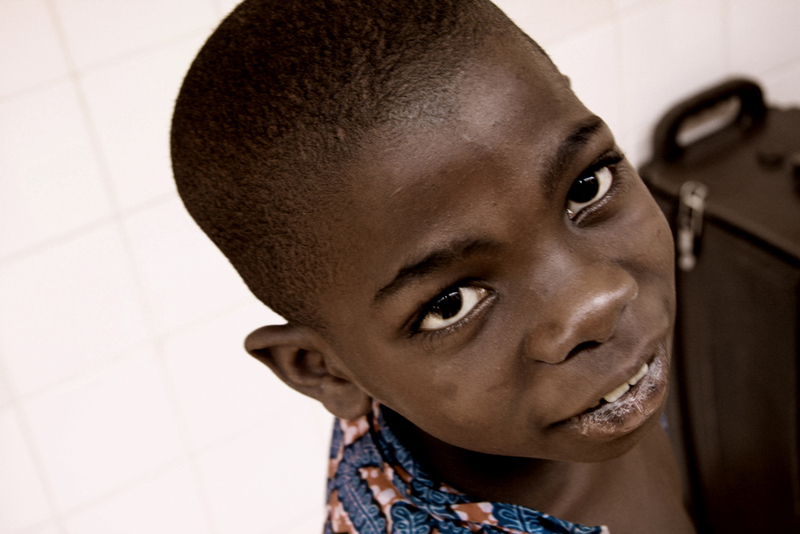 Organizations like SmileTrain donate $450 per cleft lip and palate that need to be treated. If we don't take the proper documentation to prove that the patients needed the procedure, Mercy Ships won't be provided the proper funding and has to absorb the cost of the operation. It took four of us to photograph one baby for this documentation. Since they are healing from the palette surgery its a delicate process to get the infants to open their mouth wide enough to shoot the roof of their mouth. One nurse held a flash light, another held the tongue depressor, my peer cradled the baby I snapped the shot. It took several attempts before we got a clear shot while this little one squirmed about like a baby aligator. The whole process can be a stressful experience since you don't want to cause the infant any pain but its a necessary procedure. In addition to providing free medical care, local doctors come aboard the Africa Mercy to receive further training. This is no easy task because even if the knowlege is acquired, the infrastructure may not exist in some West African countries to put the training into practice. This is a fairly new development in the Mercy Ships operations but the hope is that doctors of prospective countries can eventually be self sustaining and train other medical professionals. There is an agricultural team on board that also trains local farmers in harvesting techniques. The photographers cover all sorts of training sessions. For three months I'll be volunteering with Mercy Ships a global non-profit that provides free medical care to the poor. I'll be living and working aboard the Africa Mercy, a large hospital ship home to roughly 350 volunteers. The ship spends roughly 6 months to a year in ports around West Africa and is currently docked in Lomé, Togo. My job will be serving as a photographer giving a voice to the patients and the efforts of the medical staff. The goal is to continue spreading awareness and raising support for this operation so that lives can continue to be saved and renewed. On the plane from Brussels I met two other volunteers who will also be serving short term. After a long flight we finally arrived in Lomé. The airport is small with only one waiting room and one baggage claim. We were picked up by Californian named Josh who I will also be working with in the media department. Shortly outside the airport the pavement became dirt roads. Our Land Rover drove through the dusty streets as we passed shacks and trash lit bonfires. We arrived only fifteen minutes later and I was able to catch my first glimpse of the Africa Mercy. The bright white ship seemed like a beacon in the industrial port. Four medical tents and twenty more Mercy Ships Land Rovers lined the docks. I was warmly greeted by a woman from hospitality at the ship and shown my cabin. After meeting my cabin mates, I got some much needed rest. Though tired from my journey I was extremely excited for all the challenges that lie ahead. A collection of works in progress with some words.